Two-hit wonder. 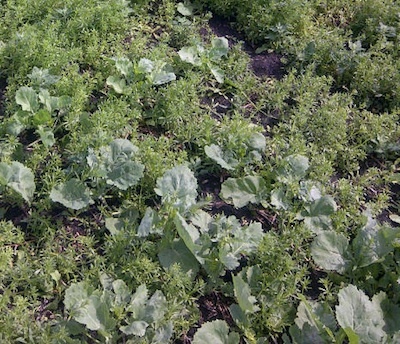 Does your canola really need a second in-crop herbicide application? Only certain circumstances — like the one photographed above — make it worthwhile. 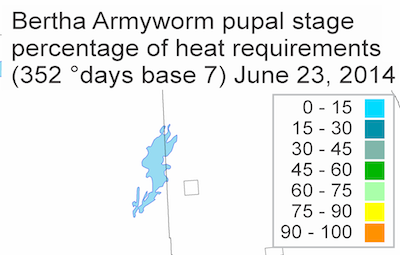 Summer heat A new PAMI project will look into summer effects on stored canola, and help set best practices to prevent heating: Aerate to warm it, turn it to warm it, or just leave it cold? Have you checked stored canola lately? 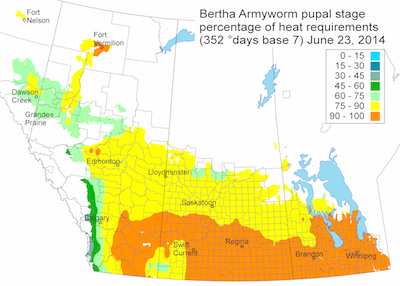 Clubroot conundrum. 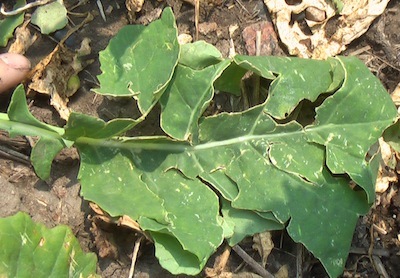 No current commercial clubroot-resistant canola hybrids have resistance to the different strain found in Alberta. Equipment sanitation and long rotations will be required to prevent the pathogen’s buildup and spread. Insect Aside. 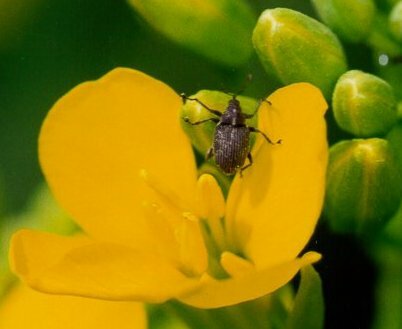 Are striped flea beetles taking over? Maybe, but that shouldn’t change the steps in making the decision to apply an in-crop insecticide. 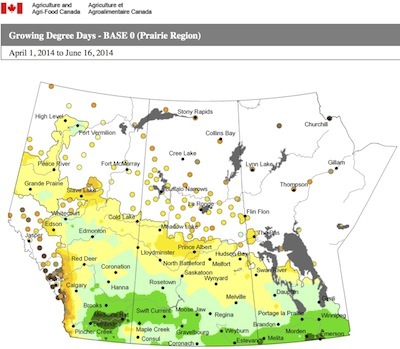 Click “read more” to compare this map with growing degree days (GDDs) for 2013 at this time, and see why this information is important for canola agronomy. In this week’s quiz, we ask you to identify five weeds — including the one above. 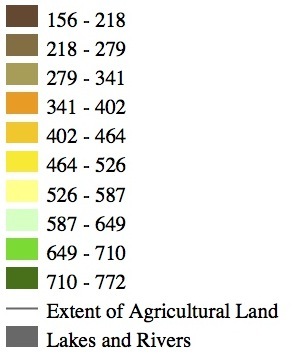 With the answers, we also provide useful agronomy information for each weed. 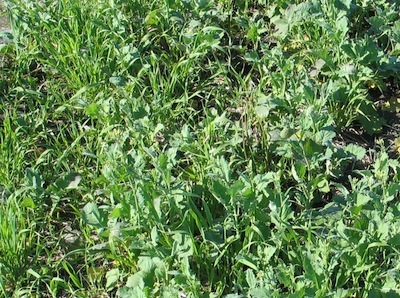 Second pass of herbicide: When does it make sense? 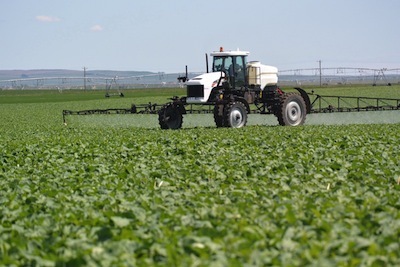 Growers who usually spray twice may not need that second pass this year if the canopy has closed, weeds are behind the crop, and the recommended application window is past. The crop should outcompete the weeds all on its own, and the economic benefit of the second herbicide application just won’t be there. But if the crop looks like the photo above, a second spray will likely pay. The longer a herbicide sits in a sprayer, the greater the risk that it is going to hang up in the tank. Sprayers should be cleaned at the end of every work day regardless if the same product or tank mix is being sprayed the following day.